A celebration that will honor the life and ministry of Rev. Forrest Jackson will be held at First Grace Brethren Church, 2624 Stonequarry Rd., Dayton, Ohio 45414, at 3 p.m., Sunday, June 12, with Pastor Bruce A. Jackson officiating. 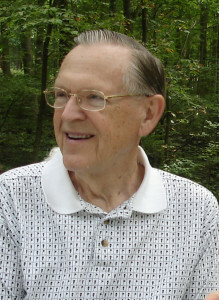 Forrest went to be with his Lord and Savior, Jesus Christ, on Wednesday, May 25 at Grace Brethren Village in Englewood, Ohio. The family will receive guests and friends with words of encouragement at a fellowship reception at 4 p.m. All those who love the Jackson family and have been touched by their ministry are invited to come! Rev. Forrest Jackson was born in Hobart, Ind., on Dec. 29, 1932 to Hubert and Mary Jackson and had five siblings. He is survived by his wife of 60 years, Arlene (Smith) Jackson, and three children: David (Sandy) Jackson of Frankfort, Mich., Bruce A. (Brenda) Jackson of Butler Twp., Ohio, and Melody (Galen) Gingerich of West Milton, Ohio; 11 grandchildren and five great-grandchildren. He is also survived by one remaining sister, Mary (Bob) Selby, of Tucson, Ariz.
Pastor Jackson was a graduate of Taylor University (’54) where he was voted an All-American in basketball for four years. In ’54, he was part of the first “sports/missions” team called Venture For Victory and he traveled to four nations of Asia playing against the highest ranked teams in those countries. During half-time at each game, he and his teammates sang songs of faith and shared the Gospel of Jesus Christ and thousands prayed to receive Jesus as their Savior! This made such an impact on Forrest that he turned down a contract to play professional basketball with what is now the Detroit Pistons, and he answered the call of God on his life to become a pastor. He graduated from Grace Theological Seminary (’57) and served as a Grace Brethren pastor in Dallas Center, Iowa (six years), First Grace Brethren in Dayton, Ohio (38 years), and Friendship Community Church in Covington, Ohio (10 years). In addition, he served on the boards of CE National, Grace College and Theological Seminary, and the Association of Grace Brethren Ministers (who selected him as “Pastor of the Year” in 1987). Also, he led multi-denomination, cooperative citywide evangelistic efforts with notable Christian leaders like Ford Philpot, Jack VanImpe, James Robison and Franklin Graham. He was an active part of both the Vandalia, Ohio and West Milton, Ohio, Rotary Chapters. He was also a devoted member of First Grace Brethren Church (where his son, Bruce, now pastors) and attended every week at the church building that he gave leadership to build in 1987 on Stonequarry Road. Gifts in memory of Pastor Forrest Jackson may be given to First Grace Brethren Church Memorial Fund.